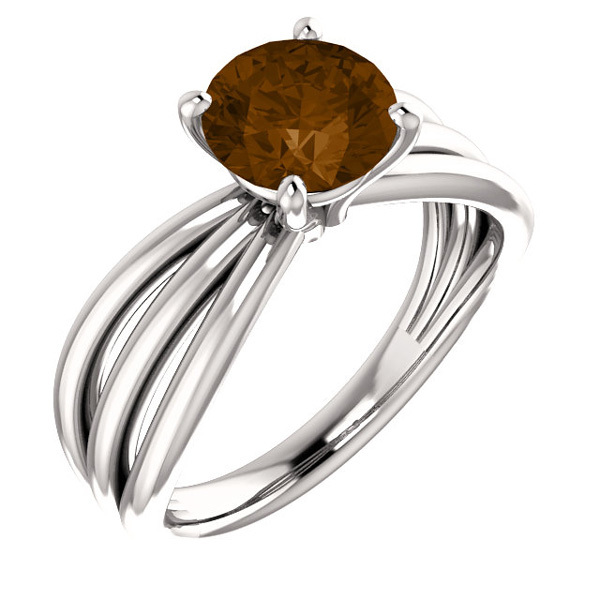 Take her breath away with this beautiful smoky quartz trinity band ring in 14K white gold from Apples of Gold Jewelry! At the very top of this unique ring sits a deep brown smoky quartz gemstone that pops against the 14K white gold of the band. The gemstone is authentic and 1.25 carats, as well as AA rated. It is a 7mm round cut stone. The band of the ring is another unique area of this stunning ring, as it begins on the bottom as a single band, but comes up to form a ring and stretches out into three bands, instead of a single one. The band measures 6.31mm at the shoulder (the widest point) to 2.6mm at the bottom shank. We guarantee our Smoky Quartz Trinity Band Ring, 14K White Gold to be high quality, authentic jewelry, as described above.